Have you ever wanted to do something but were afraid to take a risk? Perhaps resign from your current job, risk taking a new job or even leave your current profession or career for a new one. If you don’t feel that your current one speaks to your passions, your gifts and/or your vision for your life you will feel the discontent in your body and soul. Maybe you’re an adult and you want to return to school but you fear the risk of returning to school or perhaps you want to reach out to someone you’re romantically attracted to. 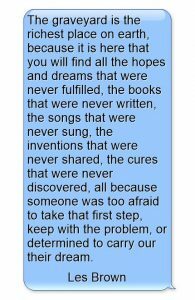 Of course we all have these fears , taking risks is scary most of the time. But at the same time , you also feel the pull of your soul calling you to grow and develop into an ever more brilliant and accomplished version of yourself. The call to matter to other people, to be significantly valued and to make a difference now. 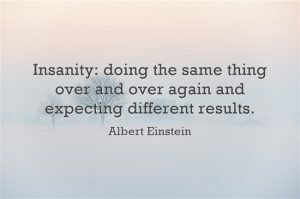 Einstein said the definition of insanity is doing the same thing over and over yet expecting a different result and aren’t we all just a little or a lot insane in this way?We keep doing the same things hoping for different results, a different life, a different career, different relationships or maybe a different self-image. I think that it’s comforting – and empowering to know that the human brain works against us in our souls desire to grow live and be huge, and to matter. Evolution engineered our brains to naturally seek and take the path of least resistance. In modern society where most of us have the luxury of physical safety and we can to one degree or another seek the actualization of our highest human potential, this nature of our brain is an impediment that our evolutionarily designed brains tendencies to seek and take the path of least resistance. It works against individual greatness in human actualization because the path of least resistance is almost certainly never the path to human actualization. Only when we push through and beyond our fears, only when we deny our desire to take the path of least resistance might we actualize our greatest human potential. Only when we move into and through our fear of risk, our fear of hardwork, failure or success, we achieve our yearning for actualization of our highest self. Personal actualization and exceptionalism take time. They take a willingness to deny our natural fear of risk, our natural desire for the path of least resistance. We must remain mindful of our brains self-limiting nature with its inclination to seek and take the path of least resistance, to play it safe, to play it small. We must deny our fear of what others may think or that they might find us delusional or arrogant because we dare to not only dream big but to believe, act and expect big. Life passes all too quickly, we have but one shot one shot to live and achieve with significance because we pass this way but once. Know and believe in who you are you’re meant to be, live your passions your purpose your gifts and skills in service of life and love. Live your highest destiny fearlessly, confidently and with certainty . Graveyards are littered with people of immeasurable potential people, who had dreams and promise. And the world is filled with incredibly successful people of amazingly average potential and skills but they know who they are and they know what they must achieve in their few short years here. Graveyards are littered with people of immeasurable potential people had who had dreams, input and promise but promising though they were, they amounted to little in their lives. Their passion is forever gone, their potential gone and they are forever scattered to the winds. They left this world unspent, unaturalized and unfulfilled, the promise of their lives a forgotten whisper of potential squandered because they were dreamers and dreamers alone, while the world remains filled with remarkably successful people people of average skill average ability even average luck, but successful nonetheless because their passion burns bright. Because they know exactly where they are going and they know that arriving there is a non-negotiable life imperative. Because when they remain certain in confidence that they will prevail they will make it happen. Unlike the people lining the graveyards they acted – they acted big, they acted constantly and they acted with certainty. Then they acted again and again. They denied their natural play it safe, seek and take the path of least resistance nature’s. They stepped into and through their fear of hard work, failure, and success of embarrassment or humiliation because to them the pain of failure is unacceptable. To them so long as they begin and they continue they know there can be no failure. We miss 100% of the shots that we don’t take. Because if we don’t take the shot failure is all we can ever know . As Goethe said knowing is not enough we must apply, wishing is not enough we must do.